I love basting this spicy, sweet, sticky glaze on grilled shrimp. The glaze perfectly complements the natural sweetness in the shrimp, and because shrimp cooks so quickly, the sugar in the glaze is less likely to burn. To make this dish even easier, I put the shrimp on skewers for easy turning. Pat shrimp dry with paper towels and thread onto skewers. Lightly brush shrimp with olive oil and season with salt and pepper to taste. In a small bowl, combine ingredients for the glaze. Preheat the grill for direct cooking over high heat. Brush the cooking grates clean. Grill shrimp over direct high heat, with the lid closed as much as possible, 3 to 5 minutes turning once. Brush the shrimp with the glaze during the last minute of cooking. 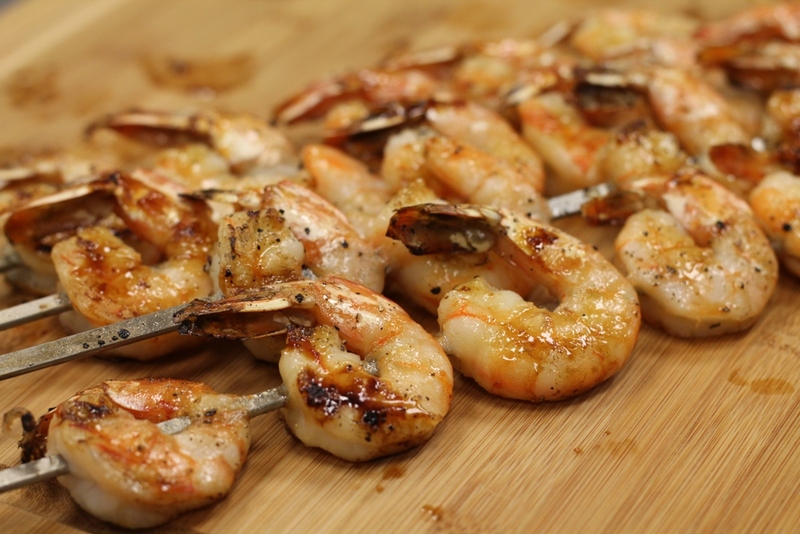 Remove shrimp from the grill and serve immediately.